Following the Russian Zvezda service module's long-awaited launch to serve as the station's living quarters, Atlantis pays a visit in September 2000 to prepare the complex for arrival of the first resident crew. An impromptu maintenance mission to the new space station was flown by Atlantis in May 2000. The astronauts narrate their mission highlights. The first shuttle mission to dock with the fledgling International Space Station came in May 1999 when Discovery linked up with the two-module orbiting outpost. The STS-96 crew tells story of the mission. Construction of the International Space Station commenced with Russia's Zarya module launching aboard a Proton rocket and shuttle Endeavour bringing up the American Unity connecting hub. STS-88 crew narrates highlights from the historic first steps in building the outpost. The second American shuttle flight to dock with the space station Mir brought a new module to the Russian outpost. The astronauts narrate highlights from the Nov. 1995 mission. The STS-73 mission in 1995 marked two weeks in space for shuttle Columbia and the second trip for the U.S. Microgravity Lab. The international crew of STS-55 narrates the highlights from the second German flight of Spacelab. The STS-43 crew narrates the highlights of its mission to expand NASA's Tracking and Data Relay Satellite System. NASA's Spitzer Space Telescope has detected plump black holes where least expected -- skinny galaxies. Like people, galaxies come in different shapes and sizes. There are thin spirals both with and without central bulges of stars, and more rotund ellipticals that are themselves like giant bulges. Scientists have long held that all galaxies except the slender, bulgeless spirals harbor supermassive black holes at their cores. Furthermore, bulges were thought to be required for black holes to grow. The new Spitzer observations throw this theory into question. The infrared telescope surveyed 32 flat and bulgeless galaxies and detected monstrous black holes lurking in the bellies of seven of them. The results imply that galaxy bulges are not necessary for black hole growth; instead, a mysterious invisible substance in galaxies called dark matter could play a role. "This finding challenges the current paradigm. The fact that galaxies without bulges have black holes means that the bulges cannot be the determining factor, " said Shobita Satyapal of the George Mason University, Fairfax, Va. "It's possible that the dark matter that fills the halos around galaxies plays an important role in the early development of supermassive black holes." Satyapal presented the findings at the 211th meeting of the American Astronomical Society in Austin, Texas. A study from Satyapal and her team will be published in the April 10 issue of the Astrophysical Journal. Our own Milky Way is an example of a spiral galaxy with a bulge; from the side, it would look like a plane seen head-on, with its wings out to the side. Its black hole, though dormant and not actively "feeding," is several million times the mass of our sun. Previous observations had suggested that bulges and black holes flourished together like symbiotic species. For instance, supermassive black holes are almost always about 0.2 percent the mass of their galaxies' bulges. In other words, the more massive the bulge, the more massive the black hole. Said Satyapal, "Scientists reasoned that somehow the formation and growth of galaxy bulges and their central black holes are intimately connected." But a wrinkle appeared in this theory in 2003, when astronomers at the University of California, Berkeley, and Observatories of the Carnegie Institution of Washington, Pasadena, Calif., discovered a relatively "lightweight" supermassive black hole in a galaxy lacking a bulge. Then, earlier this year, Satyapal and her team uncovered a second supermassive black hole in a similarly svelte galaxy. In the latest study, Satyapal and her colleagues report the discovery of six more hefty black holes in thin galaxies with minimal bulges, further weakening the "bulge-black hole" theory. Why hadn't anybody seen these black holes before? 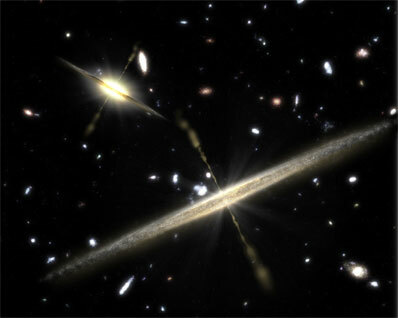 According to the scientists, bulgeless galaxies tend to be very dusty, letting little visible light escape. But infrared light can penetrate dust, so the team was able to use Spitzer's infrared spectrograph to reveal the "fingerprints" of active black holes lurking in galaxies millions of light years away. "A feeding black hole spits out high-energy light that ionizes much of the gas in the core of the galaxy," said Satyapal. "In this case, Spitzer identified the unique fingerprint of highly ionized neon -- only a feeding black hole has the energy needed to excite neon to this state." The precise masses of the newfound black holes are unknown. If bulges aren't necessary ingredients for baking up supermassive black holes, then perhaps dark matter is. Dark matter is the enigmatic substance that permeates galaxies and their surrounding halos, accounting for up to 90 percent of a galaxy's mass. So-called normal matter makes up stars, planets, living creatures and everything we see around us, whereas dark matter can't be seen. Only its gravitational effects can be felt. According to Satyapal, dark matter might somehow determine the mass of a black hole early on in the development of a galaxy. "Maybe the bulge was just serving as a proxy for the dark matter mass -- the real determining factor behind the existence and mass of a black hole in a galaxy's center," said Satyapal. Other authors of this study include: D. Vega of the George Mason University; R.P. Dudik of the George Mason University and NASA Goddard Space Flight Center, Greenbelt, Md. ; N.P. Abel of the University of Cincinnati, Ohio; and Tim Heckman of the Johns Hopkins University, Baltimore, Md. NASA's Jet Propulsion Laboratory, Pasadena, Calif., manages the Spitzer Space Telescope mission for NASA's Science Mission Directorate, Washington. Science operations are conducted at the Spitzer Science Center at the California Institute of Technology, also in Pasadena. Caltech manages JPL for NASA. Spitzer's infrared spectrograph was built by Cornell University, Ithaca, N.Y. Its development was led by Jim Houck of Cornell.